I used to live with a cat who would cry all night for the first four nights at a new home. He howled like he was getting a root canal – it was awful! Over the years, I eventually discovered how to make moving cats an easier experience. Beyond preventing distress, there are serious risks to avoid. Occasionally cats disappear on move days or shortly after moving. It’s rare, but it happens. The good news is that by applying some best practices, we can all pull off the moving-with-cats thing with more ease. I put the following timeline checklist together for a good friend. It’s based on personal experience as well as cat behaviorist advice. Create carrier love: If your cats are not naturally thrilled with carriers, put the carrier out. Open it so cats explore and become comfortable with it. Make it inviting by putting catnip and treats near or inside the carrier. Some experts also advise feeding your cats near the carrier. Prepare your cats: Some behaviorists say it’s a good idea to start keeping outdoor cats inside for about a week before you move because cats may find the packing and sense of upheaval so upsetting that they could run away before you move. (I haven’t heard of this happening before a move, though I have heard of it on the day of a move.) 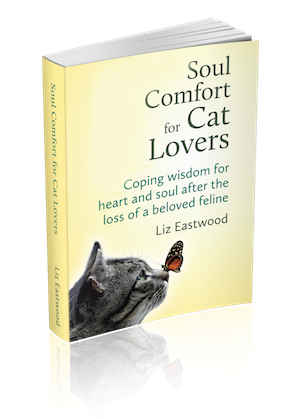 Also, the author of The Natural Cat, cat expert Anitra Frazier, says that because cats don’t like being surprised, it helps to explain ahead what will happen and reassure them it’s all good. Whether they understand you or not, what have you got to lose? I do this when we are going on trips and before big changes and I suspect it somehow helps. Set up the mover-free cat sanctuary: Clear out a small room in the home you are moving out of (it can even be a bathroom, if necessary). If at all possible, move out all boxes and objects. You want a room where your cats will be safe – where no one will open the door and accidentally let them flee. Give the room a litter box, fresh water, food, and familiar blankets or cat beds with familiar smells. A scratching post is a bonus item. NOTE: This timeline is for moving cats to a nearby town. For long-trip moves, also check out 9 Tips for Moving Your Cats Across Country and my Traveling long-distance with cats: tips & resources for the road. Post a Do Not Enter sign on the mover-free cat room in the home you are moving out of. Do not let your cats outside while you move all your things. If you do, they may not show up when you return to get them. This is the day they are going to be most freaked out. Keep them inside, in one room that is off-limits to any humans who may inadvertently let them get out. Get a simple room ready for them at the new home: Choose a room in the new home where the cats will stay for the night. If they usually sleep with you, make it the bedroom. This is where you will put a litter box, fresh water, food, and familiar blankets or cat beds with familiar smells. Move cats last. After you’ve moved all your things, go back to get your cats, the litter box, etc. Bring them directly to their designated room at the new home with all their things. Make it their new cat sanctuary. Keep the door to this room closed, as most cats are overwhelmed by the whole of a new home and adjust better if they start with one room. It may seem counter-intuitive, but it’s generally true. Prevent overwhelm by introducing rooms gradually: Cats need time to get comfortable with their new territory and trust it’s where they belong. Depending on how quickly your cats seem to be adjusting, keep them in their new room and gradually give them access to the rest of the house. This could take about 2 – 4 days. Try behaviorist Pam Bennet Johnson’s sock trick to help cats adjust: She writes: “Take a clean sock, put it on your hand and then gently pet your cat around the mouth to collect his facial pheromones. Then, rub the sock on the corners of objects (at kitty’s nose height). He’ll think he facially rubbed there and that may help him become more comfortable in the environment.” Pam recommends doing this several times around the house as your cat gets used to the new environment. An alternative to the sock trick is to use Feliway spray or diffuser, although not all cats respond to it. Keep outdoor/indoor cats in for about a week: This is a good idea because there is a risk that the shock of all the unknown territory could send some cats looking for their old neighborhood. Getting them used to their new home, with regular feeding routines, is said to increase their confidence and comfort so they return once they go outside again. Pet Tube Car Kennel for long drives: A reader said this spacious tube, which takes up two seats, worked well for moving her two cats across country together. (Ideal for two cats who adore each other – like our Phil & Joel.) It’s also a luxurious ride for one cat and straps in securely. I see that it has a ton of rave reviews. We will use this for any long drives. Feliway: A manufactured version of the feline facial pheromone used by cats to mark their territory as safe. Many people say that spraying this on surrounding objects (not on cats!) helps their cats feel calmer, though it doesn’t work for all cats. 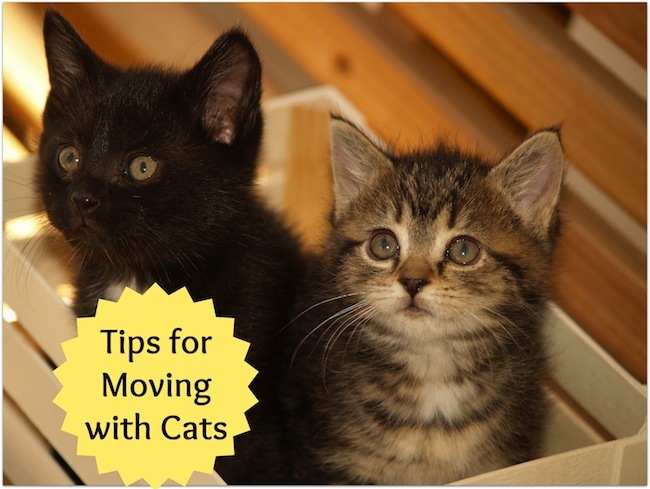 Do you have a cat moving story or tips? If you have any stories or tips that could help people move their cats successfully, don’t hesitate to share them with others in the Comments. Thank you! We live in the country, have 6 cats (very good at keeping snakes away) we have only been able to pet two of them, the others only come close during feeding time. We are going to move, I want to take them with us, HOW to capture and travel three hours to a new country home???? Thanks for the great post1 It’s exactly what I needed for my move. This time is mi first moving together with my cat and I’m so excited. I hope she’ll be fine with the travel and thank you for the timeline and checklist. /these make things much easier. Greets! i have moved vats numerous times even accross country via airplane. when i get them to there new enviorment i put butter on there paws, does 2 things keeps them busy cleaning and also gets rid of the old house smell on there paws. I’ve found three weeks to be a much safer length of time to keep a cat within a new environment before offering free reign. Even after that length I only let my cats outside (24-7) within a large, wire compound for their protection. Never can tell when some strange situation may occur to harm your pet. I hope this is useful to cat owners. The best way my cat, Boxie has adjusted to stress, whether from a move, trip to the vet, or if she has to be home alone, is by the pheromone collar. It really relaxes her and she is a lot less stressed when she wears. My husband and I always make sure we have one on hand for stressful situations our cat may encounter. Great tips, but I’m wondering if you have any more ideas for a long distance move? I have 3 cats (all girls) who generally get along quite well. I may be moving from Texas to South Carolina, which is a 2 day drive (~15 hours)… Do you have any suggestions for how to deal with the overnight hotel stay? Any suggestions for in the car for the long car ride? Thanks! Oops, sorry I missed the links in the article! Thanks!!! I got him a light sedative. Gave him a tiny piece of the pill as it was strong. Got a large crate w familiar scented towels. He didn’t eat or drink till stops or getting to the hotel ( so don’t worry if he doesn’t eat/ drink on the road. The hotel was pretty surprisingly easy. Let him out of the crate, he checked out the room and ate. I left the crate in the room with the door open. He slept on my bed ( on his favorite blanket) and sat on the window sill. Sorry, one more thing, have you heard of HomePet Anxiety Relief drops? We are going to be moving 7 cats across country, some semi-feral, some very friendly. I know we can’t use essential oils, but I’m wondering if there’s anything else relaxing that we can do to prepare ahead of time. I bought a CD that’s supposed to work, I wonder if I start playing it months ahead of time (we won’t be moving for a few months) that will help. Thanks in advance! Hi my name is rochak I have one cat he is 6 month old I just want to know my cat is doing toilet every were in my house wherever he likes but my family dnt like it I love my cat but how to teach my cat not to do toilet every where but to do in a toilet plz help me otherwise my parent will keep my cat out of my house I dnt like it if my parent do I love my cat plz help me how to train my cat…. Rochak, this is often caused by a medical issue — like a bladder infection or kidney trouble. Please take him to a vet. Liz, I just found your site and am really enjoying it! I’ve had 3 cats (a year apart in age) make it to almost 18 and 18+ (I just lost one and lost another 1.5 years ago – so will be buying your book on losing a pet…). I’ve made 4 moves with these cats over the years – and it’s never easy on them. This most recent move I did almost everything you suggested (I’ve learned over the years!). Those things definitely help ease the transition, as it can be quite traumatic for cats. In the past, they’ve always hidden under the bed for the first few days or even a week until finally deciding it was safe to come out and explore. This time, though, they found their way into the lining of my bed’s box springs – ugh! That was a nice, safe, cozy place for them – but needless to say, the lining is now destroyed. Once I finally got them out from there, I put things under the bed (anything I could find that would fit) so they wouldn’t go back under there until I can get it fixed (may have to be replaced altogether). Even though they were both 18 years old at the time of this this last move, they actually seemed to adjust more quickly than with previous moves. Sadly, though, I had to say goodbye to one of them just 3 weeks ago – which was heartbreaking. His sister is still with me and doing well (lab reports from a recent vet visit were all very good for her age, which is a relief!). I really hated moving them at such an elderly age, but am glad they adjusted well, all things considered. The tips you provided are all excellent! My cats have always been strictly indoors, but I can definitely see the danger of cats taking off just before or during a move, or trying to find their old home once moved if allowed outdoors too soon. Thank you Cheryl! Ah yes, the hiding under the bed – I almost forgot about that routine. I am so sorry one of your cats transitioned on recently. 18 years is great accomplishment for cats these days, but that doesn’t make it any easier. Thanks again for sharing your stories here. I thought I’d share the experience of my two guys who adopted me in my college days and then moved, moved, moved, moved, and moved with me. I thought they were pros at moving, but turns out it gets harder on them as they become elders, not easier. Their penultimate move really freaked them out. When they saw the boxes they started hiding (not normal – they were Dudes!) in weird places. So, for their last move, before there was any hint of moving, they went to stay with their “uncle” – someone they knew and liked and who was not presently sharing their home with other four-leggers (I know, that’s not possible for everyone). They stayed with him for 2 weeks while we packed up one place, moved everything 45 miles away, and then unpacked into the new place. When they were picked up, all spoiled and happy, from their uncle’s house, they arrived to a home where everything was already put away and their scent was all over the place. It was a much easier adjustment. Janice, thank you! 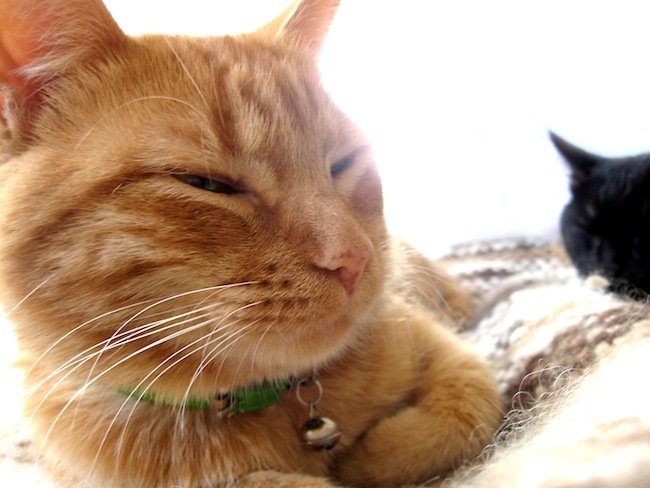 Love your happy cat-moving story. Staying with an uncle (or similar) who they love, until after everything is settled, can be a great idea. Wow Liz!!! Thank you so much for this information! It seems very helpful and we will be sure to use it for our imminent move. That helped me feel less fearful, like it can actually work out just fine. I needed that. Thank You! I’m so glad Jenna! Thanks for letting me know.